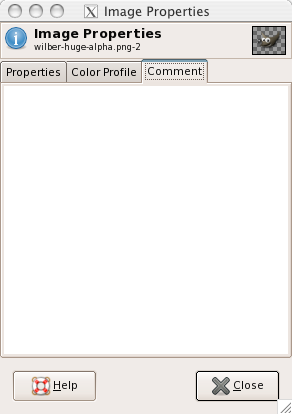 The “Image Properties” command opens a window that shows lots of different information for the image. or by using the keyboard shortcut Alt+Return. The properties window is divided into three tabs. Shows the image height and width in pixels, that is, the physical size of the image. Shows the size the image will have when it is printed, in the current units. This is the logical size of the image. It depends upon the physical size of the image and the screen resolution. 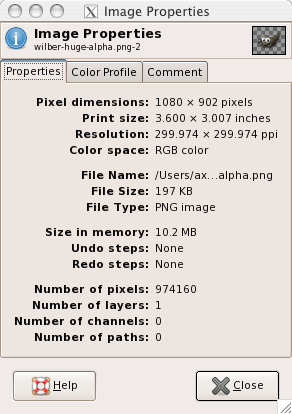 Shows the print resolution of the image in pixel per inch. Shows the images color space. Path and name of the file that contains the image. Size of the file that contains the image. Format of the file that contains the image. RAM consumption of the loaded image including the images journal. This information is also displayed in the image window. The size is quite different from the size of the file on disk. That is because the displayed image is decompressed and because GIMP keeps a copy of the image in memory for Redo operations. Number of actions you have performed on the image, that you can undo. You can see them in the Undo History dialog. Number of actions you have undone, that you can redo. 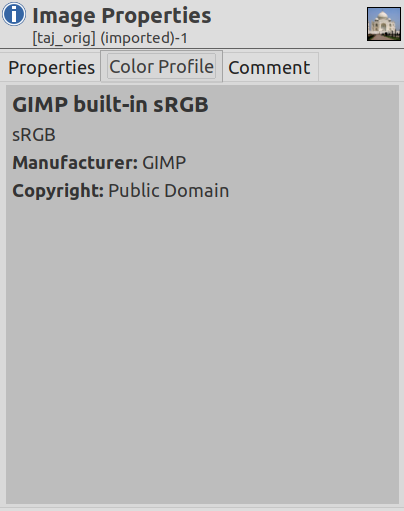 This tab contains the name of the color profile the image is loaded into GIMP with. Default is the built-in “sRGB” profile. This tab allows you to view and edit a comment for the image.